There is indeed evidence that getting celiac disease symptoms from inhaling airborne gluten is possible, even though this is not a question that has been researched extensively. One medical report backs the idea that inhaling gluten, rather than eating a food that contains gluten, can be enough to trigger celiac disease symptoms. In addition, there's ample anecdotal evidence that airborne gluten can cause symptoms, both for people with celiac and for those with non-celiac gluten sensitivity. So while airborne gluten has not been proven to cause problems, if you have celiac disease or non-celiac gluten sensitivity and continue to have symptoms despite following a gluten-free diet, it would make sense to look for possible airborne sources of gluten in your environment. The medical report, published in the New England Journal of Medicine in 1997, involved two farmers diagnosed with a serious form celiac disease that didn't seem to be responding to the gluten-free diet (also known as refractory celiac disease). Each day, the researchers found, the two spent time in an enclosed space, feeding their cattle a mixture of barley, wheat and other grains that contained at least 6% dust particles by weight. 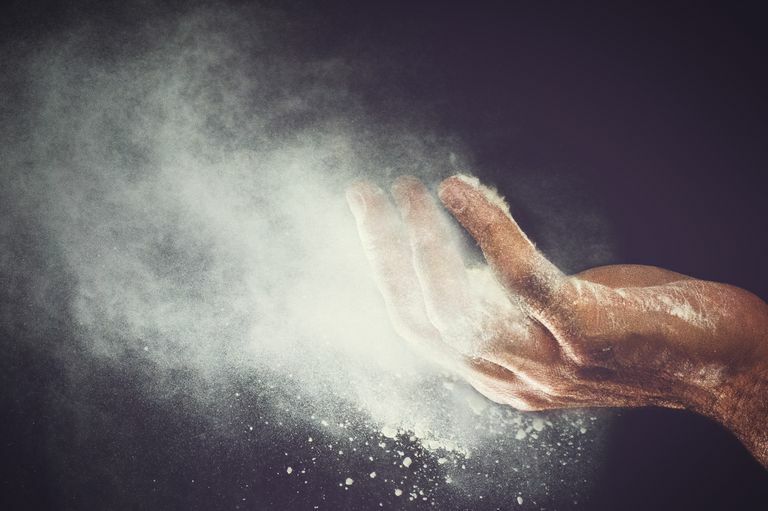 The report estimates that the two farmers "were potentially exposed to over 150 g of gluten-containing dust particles per day, which they were inhaling and ingesting." For reference, that's about 15,000 times the amount of gluten considered "too much" on a daily basis for a person with celiac disease. Both farmers suffered from ongoing symptoms, including cramps, bloating, fatigue and diarrhea. One of the farmers—the one with the worst symptoms—had total villous atrophy (the intestinal damage that characterizes celiac disease), despite following the gluten-free diet. The other, who also followed a gluten-free diet, also showed intestinal damage, although it was less severe. Once both farmers began wearing face masks, their symptoms cleared up. The farmer with the more severe intestinal damage saw improvement in his intestinal lining, and the other farmer had total resolution of the damage. What Does This Mean for Other Celiacs? Most of us aren't farmers, nor are we exposed to that much gluten each day, either from gluten in "gluten-free" foods or from airborne gluten. However, it shows that airborne gluten can have an effect and cause symptoms. For non-farmers, there aren't any medical studies that show airborne gluten can be a problem. However, anecdotal evidence suggests you can get glutened from airborne flour, either in a private kitchen or even near an active grocery store bakery. You don't have to be super-sensitive to trace gluten, either. Pet food may pose a potential problem, according to the clinicians who wrote the airborne gluten medical report. Many brands of dry pet food contain gluten, and when you pour it out, it's possible to inhale some of it. Therefore, you may want to consider switching to gluten-free pet food. In addition, some powdered household products, such as drywall compound, contain gluten, and working with these may cause a reaction. Never use flour in the kitchen. Don't work with flour; don't let anyone else work with flour in your kitchen, and don't visit with friends and family members in their kitchens while they're working with flour. Switch to gluten-free pet food. It's theoretically possible for you to avoid the dust if a) someone else feeds your pet, and b) you keep the food and the bowl outside. But if you have a close relationship with your pet, you'll be better off switching anyway, since you'll likely be exposed whenever your pet licks you or nuzzles you. Avoid places where drywall is being installed. If you need to have work done on your house, have someone else do it and stay away until the work site's been thoroughly cleaned up. Don't use ready-made spackling putty or compound, either, since many are wheat-based. Exercise caution around store-based bakeries. Some of these seem fine, while others are problematic. The difference may be in the ventilation systems. Smelling bread and other products that are baking won't make you react, but If you can smell the bread and cookies baking, there may also be flour in the air, and you may be risking an airborne reaction because of that. Consider using a face mask in certain situations. This isn't by any means foolproof, but for short exposures, it might do the trick. Look for a full respirator, rather than a painter's mask — they're about $40 in home improvement centers. If you have asthma or another respiratory condition that affects your breathing, you should use a respirator with caution and remove it if you have trouble breathing with it on. Not everyone needs to take all these precautions; if you're not particularly sensitive to gluten cross-contamination, you may be fine in most or all of these situations. But if you find you're still having unexplained symptoms, even though you follow the gluten-free diet very strictly, you might want to check out your environment as well as your food. Kasim S. et al. Nonresponsive Celiac Disease Due to Inhaled Gluten. New England Journal of Medicine 2007; 356:2548-2549. Can You Get Glutened Just By Smelling Bread?